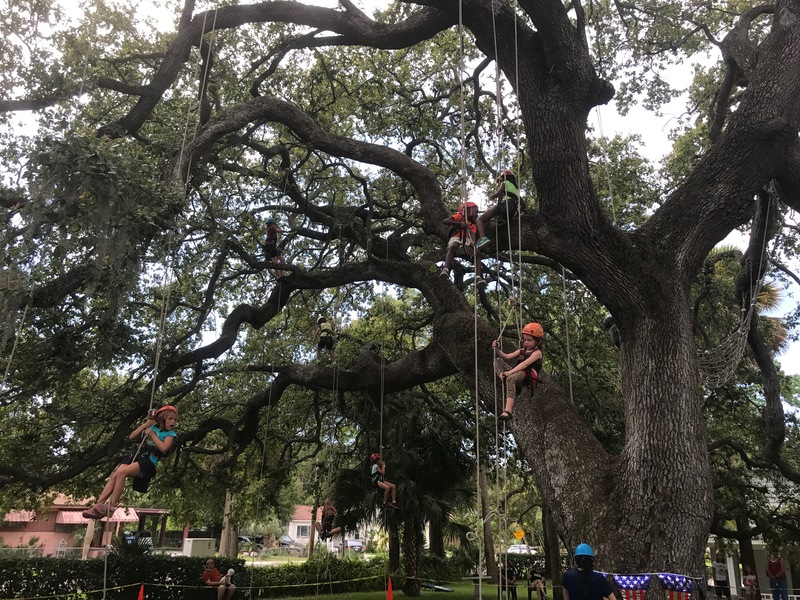 I sent my four kids high up into a magnificently beautiful huge live oak tree with ropes and helmets and they all loved it! Of course they did! Have you seen this tree? 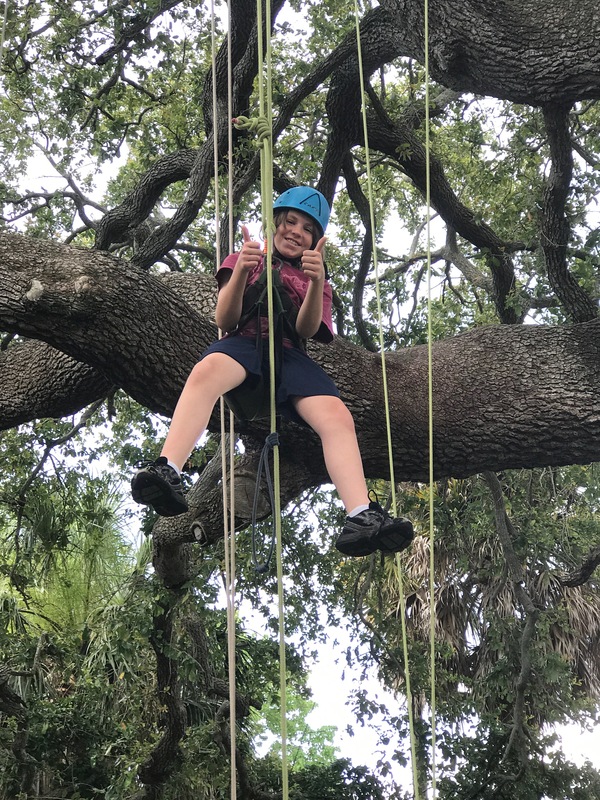 Pathfinder Outdoor Education offers an Open Tree Climb on the first Saturday of each month and I’d seen Facebook events for it for ages. However, there was always something keeping us from going. Finally, the stars aligned and I took them up to Saint Petersburg to try it out. I’m so glad I waited because you have to be at least 6 years old to climb so my youngest only just made the cut by about 10 days – and she absolutely loved it! Once I saw the set-up, I was a little nervous about whether or not she’d be able to figure out all the ropes but she got it, and quickly. 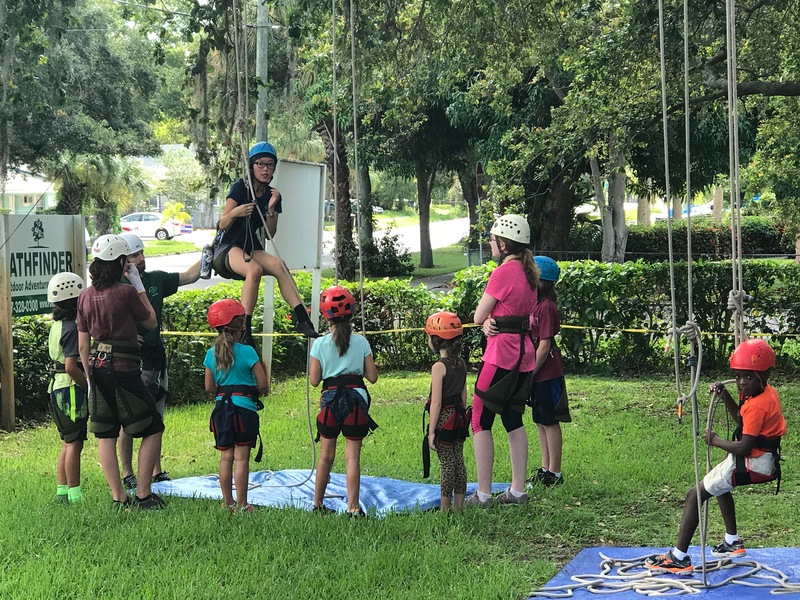 They got all harnessed up and got a little “ground school” before being let loose in the tree so she was equipped with everything she needed to know. It can take some people a little bit to figure out what works best for them for a good climbing experience. One kid actually climbed better without the foot loop. Another preferred to climb with fingerless gloves. Yet another was happy doing everything as suggested. The guides were happy to accommodate everyone as they went at their own pace and comfort level. There was never any pressure to go higher or faster or anything like that. 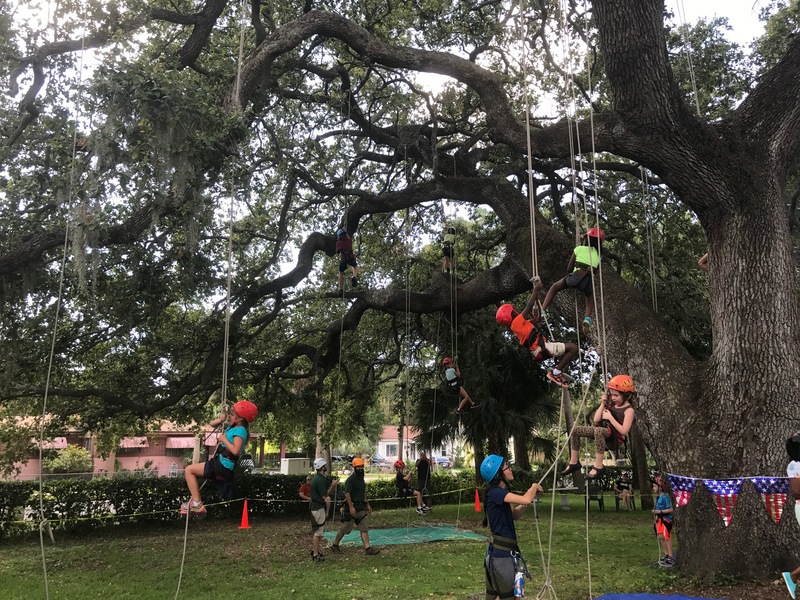 Kids all moved at their own pace and did what they wanted to do, whether that was standing on tree branches or going upside down or simply climbing upwards. All the guides were very friendly and helpful. They joked with the kids, they were quick to respond to requests for help (such as “Can you swing me to that branch over there?” and then, after an initial swing, “Never mind! !”), and they looked like they were happy to be there. While I didn’t choose to climb, one or two other adults did and I actually overheard someone saying their oldest climber was 94 years old (which put me to shame), so it’s definitely a fun activity for all ages. I was pleased to see how high my 6-year-old climbed without any fear or hesitation. The cost for this whole experience was only $10 per climber and that lets you climb for the whole session. The session was from 10am to 2pm and they divided it into blocks of roughly an hour each. 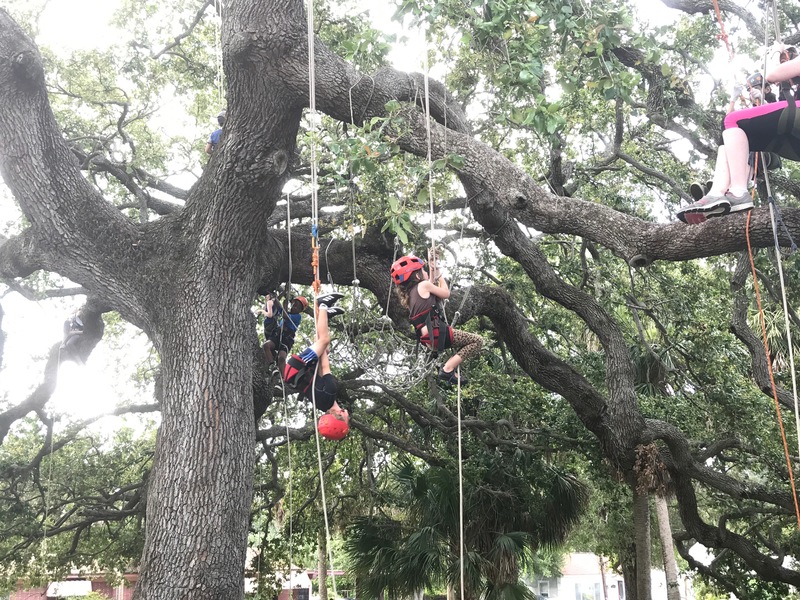 Between ground school and getting everyone down from the tree, I’d say each block was almost 45 minutes of actual climbing in the tree. Everyone gets down at the end of a block and turns in their harnesses and helmets and the next block gets ready. My kids had so much fun in the first block, they all wanted to go again. When getting ready for a new block, they take those who have not yet climbed first, but luckily there was room for all 4 of mine to go again so they harnessed back up (after a water break) and got right back in the tree. They each got different spots the second time around so that was fun too. Some spots offer a place to get onto the tree branches and get some skin-to-bark time, some are great for swinging, some get you access to a rope net to sit in, some are good for climbing high up and having a little upside down time… So, there’s variety in every climb. After the second time in the tree, my boys wanted to go again for round three but my girls opted for a watermelon break – they have corn hole, hula hoops, and watermelon while you wait. Shortly after my youngest polished off her watermelon and saw the boys high up in the tree again, she decided she wanted another turn too. Luckily there was one space left so she got harnessed up and clipped in. She was approximately one foot off the ground when we heard it…. the deep rumble of thunder that is so characteristic of a summer afternoon in Florida! They soon announced that lightning was too close and it was time to get out of the tree. All climbers lowered themselves to the ground like professionals, with the help of the guides. We’d had a great run, or climb, and so we headed back home rather than wait for the storm to pass. We brought home a few blisters, some stinky sweaty clothes and a lot of happy smiles! When we got home, they were excited to tell Daddy of our adventure. All said they wanted to go back. It was a double-thumbs-up experience!